← Pertussis In Infants and Children – What Can We Do To Prevent Tragedy? A great lecture on chronic cough by Dr. Michael D. Shepperd, Cough: Pharmacologic and Nonpharmacologic Remedies [Link is to the written summary], is available at COMBATING THE PERSISTENT COUGH Audio-Digest Family Practice Volume 62, Issue 16 April 28, 2014 and the summary is very quick review. An acute cough is one that lasts three weeks or less and most are due to an upper respiratory. One study found the mean duration of acute cough was 18 days and most people expect it to last only five to seven days [so maybe we should warn them]. A subacute cough is one that lasts between three weeks and eight weeks. A chronic cough is one that lasts eight weeks or more. There is no evidence in the literature that codeine works and it has some potentially dangerous side effects. In the post viral cough, ipratropium and tiotropium help. They work, not by bronchodilation, but by blocking the cough receptors that trigger cough. 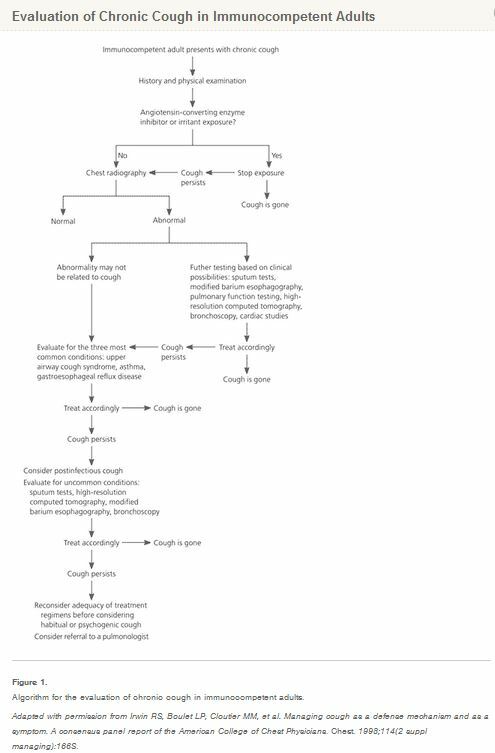 An excellent article on the assessment and management of chronic cough is Evaluation of the Patient with Chronic Cough. JOSEPH J. BENICH III, MD, and PETER J. CAREK, MD, MS, Medical University of South Carolina, Charleston, South Carolina, Am Fam Physician. 2011 Oct 15;84(8):887-892. Initial evaluation of the patient with chronic cough (i.e., of more than eight weeks’ duration) should include a focused history and physical examination, and in most patients, chest radiography. Patients who are taking an angiotensin-converting enzyme inhibitor should switch to a medication from another drug class. The most common causes of chronic cough in adults are upper airway cough syndrome, asthma, and gastroesophageal reflux disease, alone or in combination. If upper airway cough syndrome is suspected, a trial of a decongestant and a first-generation antihistamine is warranted. The diagnosis of asthma should be confirmed based on clinical response to empiric therapy with inhaled bronchodilators or corticosteroids. 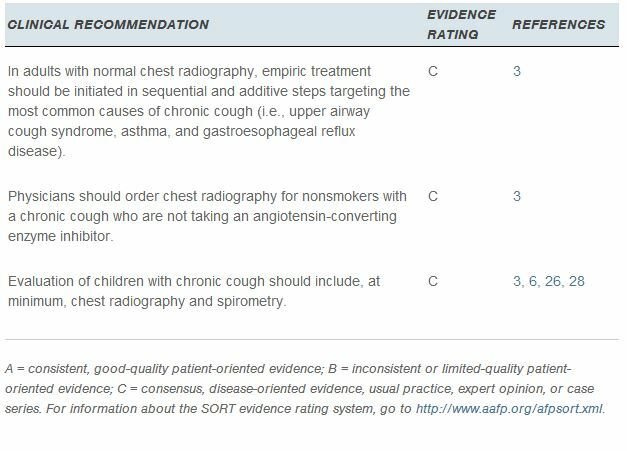 Empiric treatment for gastroesophageal reflux disease should be initiated in lieu of testing for patients with chronic cough and reflux symptoms. Patients should avoid exposure to cough-evoking irritants, such as cigarette smoke. Further testing, such as high-resolution computed tomography, and referral to a pulmonologist may be indicated if the cause of chronic cough is not identified. In children, a cough lasting longer than four weeks is considered chronic. The most common causes in children are respiratory tract infections, asthma, and gastroesophageal reflux disease. 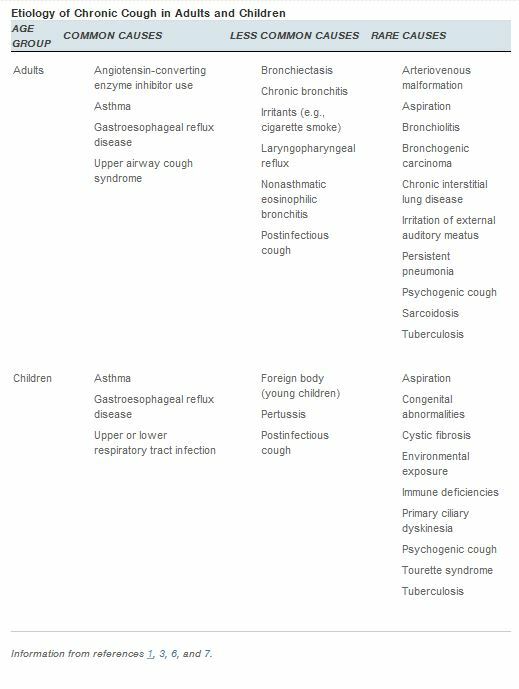 Evaluation of children with chronic cough should include chest radiography and spirometry. This entry was posted in Evaluation of Symptoms, Family Medicine, Infectious Diseases, Internal Medicine, Pediatrics, Pulmonology, Symptoms. Bookmark the permalink.